Foreigner’s Eye: I Married a Nepali Mountain Biker! | United We Blog! Foreigner’s Eye: I Married a Nepali Mountain Biker! I’m a recently married man…twice, all in the space of just 7 months and to the same girl! I first came to Nepal in 1997 at the age of 18 as a volunteer English teacher for a little school in Koteshwor. I arranged the position through a friend of a friend and eventually received a letter, several months old by the time it reached me in January 1997 saying, “We will meet you at the airport in September and you will need a yellow suit and some teaching materials”, so duly warned I arrived in the brightest yellow suit I could find at Tribhuvan airport carrying a bag of posters and childrens books and cassettes of fun songs! I was met by about 50 children in school Uniform at the airport all with flower mallas and Tikka and I think my reception there was better than the Foreign Diplomats arriving on the same plane! This was the beginning of my love affair with Nepal and everything Nepalese. My Grandfather had been a Major in the Indian Ghurka Regiments in the 1940’s and he had served in Burma and I was an Artillery Reservist for 4 years whilst at University, so having been to Nepal already it wasn’t a hard decision to return after University and spend the next 10 years working for a variety of Private and INGO companies from Fundraising to Youth development. In particular I spent 2 years freelancing with the NGO Youth Initiative running their Civic Leadership School with my friend Deependra. My personal passion was working with local guides and training them to work with Western groups and Cultures and in particular Canyoning and Climbing rope skills as well as big overland expeditions. This led me to travel all over Nepal and India and Tibet and gave me the opportunity to develop my spoken Nepali and to really explore the wonderfully different cultures all over this beautiful region. I started Mtn Biking for fun and then really developed a liking for it and in my spare time I travelled with Male National players to Sikkim to race and raced myself all over Nepal. In 2008 I went to the UAE to work on a Military project running a National Cadet Corps with Emirati children in School but I kept my flat in Kathmandu and flew home every month for a weekend break and to climb or mtn bike with friends. I met the love of my life in Nagarjun forest in January 2009. I as the overweight and unfit Gora was pushing my bike up the hill and she as the super-fit and National Champion was riding her bike downhill and our paths crossed. It’s amazing what a common interest in cycling can do for a persons relationships! As we got to know each other over the next few months I went from being a Single expat in a foreign land to having a girlfriend and then last year being engaged and having a huge extended Nepalese family. Speaking of engagements you may have seen ours in the press! In case you haven’t guessed it yet my wife is the beautiful and very accomplished Nepal National Mountain Bike player – Nirjala Tamrakar! The engagement ceremony was almost the same as a whole English wedding with friends, relatives and a religious program which included exchanging rings. It felt like we were already married last August but still to come was the proper Wedding in January of this year…4 whole days of it! Now I thought I was pretty well prepared for a Nepalese wedding, I had practiced my Nepali and squeezed into the fantastic set of Shrestha Tailoring Dawra Surwals that I had had made a few months before and unfortunately gained weight before wearing! So come the time for the ceremony with the Priest I was feeling quietly confident…however 2 minutes into the 4 days of celebrations I had the terrible realisation that I had no idea what anyone was saying to me as they were all talking in Newari! Luckily for me I had family from the UK and friends from the UAE, Nirjalas brilliant brother Nipun and my Best man Deependra to guide me through the wonderful whirlwind of dancing, eating, rakshi drinking and celebrations that was our magical Nepalese wedding. So this summer not being satisfied with just one wedding in Nepal we did the whole thing again in the UK with my family and Nirjala in a beautiful white wedding dress (which ironically in Nepal is the colour to wear to a funeral). This time it was Nirjalas turn to be shy and nervous and my families chance to help her through the whole ceremony and festivities, at least that’s what I had expected but in reality my amazing bride was the confident and intelligent and communicative woman that she is wherever she goes and whatever she does. I’m a lucky guy! After 14 years of travelling in and working in Nepal I’ve met the perfect girl for me. Best of all she’s Nepalese! Having been to many, many Nepalese weddings and never really understood what was going on, I now have a better understanding of all the amazingly intricate parts of the ceremony. And although having learnt the wrong language for 14 years didn’t help (!) I still got through with my wife and extended family by my side and despite the fact that we didn’t have a traditional arranged marriage the real bonus prize is that my family love Nirjala and my parents in law and all her family accept me for who I am and I know they like me too! Nirjala is definitely a high achiever and I have a lot to live up to and with the Olympics fast approaching in 2012 and Nirjala training hard for them and racing round the World I’ll have a hard time keeping up with her! Luckily for me, despite the difference in cultures and upbringing, I can still say that my wife is now and will always be my favourite companion, my supporter, my guide and my best friend. She will help me push my bike up those hills and encourage me to excel when life is freewheeling downhill and support me in my personal goals to stand on the winners podium….after all isn’t marriage just like Mountain biking? There are up’s and down’s, sometimes it is rocky and sometimes it is smooth but at last no matter how many weddings we had and how hard it was to understand each other’s cultures in the end all we need is love…….. …………… and mountain bikes! Dan (Bahdur) Wright is a Freelance Adventure Guide and Youth Development Facilitator in Lazimpat, Kathmandu. Wish you both all the best life can offer ! Hope for life-long love –Nepalese way. 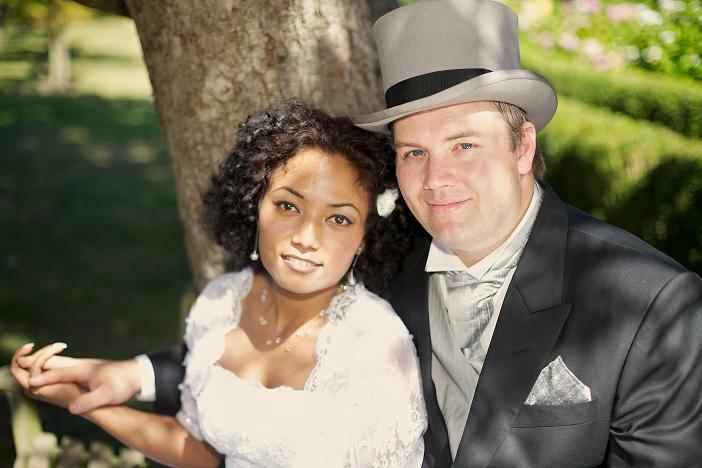 I am a 36 year old Scandinavian man and 14 months ago I got married to a Nepalese woman (Chhetri) from the Terai. My wife is 25, and we have a lovely daughter, that is 4 months old and we live in my home country. All my life I have been in love with Nepal and 7 years ago, I went there for social work. I fell in love with a woman that was working at the same place as I, and finally in 2011 we got married in Kathmandu. In the beginning, her mother was not happy and she first accepted me, on the day after our wedding. It was not a problem for the rest of the family and her father was always happy for us. I love Nepal and I would like to live there, but my wife wants to us to stay here in my country. She is always saying that our children will not have a future in Nepal and that fine by me.